Right now this is a "one of a kind" rotating musical cake plate that plays "Happy Birthday." 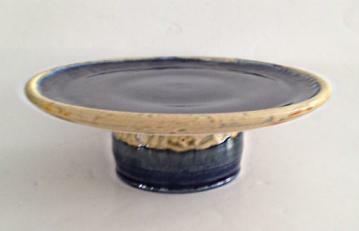 This one is a rich blue trimmed in rustic gray, made to our musical specifications by Ceramic Artist, Jack Boyle. All of his creations are safe for microwave ovens, dishwashers and conventional ovens (with the exception of its musical base). The musical movement will not hold up if watered down and you cannot place metal (of which musical mechanisms are made) in Microwaves. No toxins or leads are used in the glazing of these handmade pieces and they are individually fired to 2,300 degree. Boyle earned a fine arts degree at the University of South Florida, Tampa, Florida. Please scroll down for more information about the artist! Mr Boyle, a St Petersburg native, who creates unique pottery, everyday stoneware, and functional artwork has been creating artwork from his San Antonio studio for over 25 years. Busy throughout the year showing at art shows and arts and crafts festivals, along with doing various commissioned works that he has placed in several corporate businesses and galleries. His works have been displayed from Florida art shows like Gasparilla Art, and National Galleries and Gift Shops. His work can be seen in various gift stores from the State of Florida, to Oregon.